Are you ready for your next adventure? 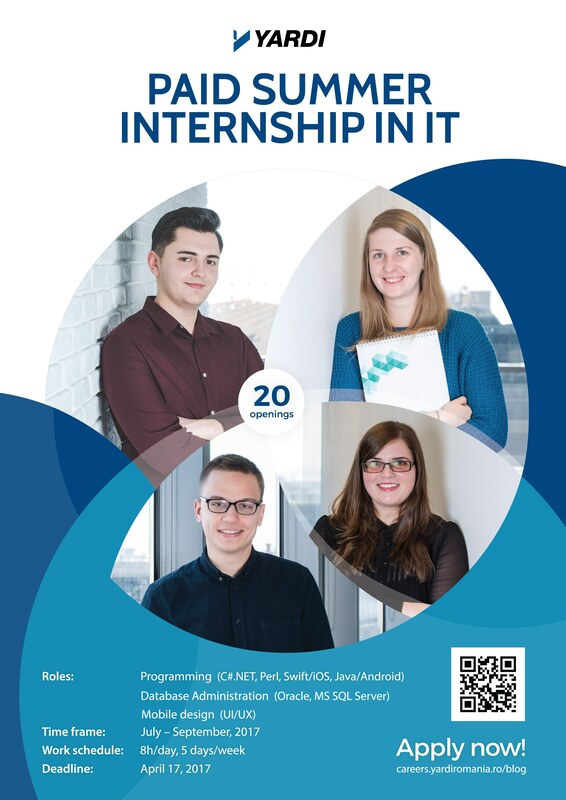 Join our 3-month, paid summer internship in IT and launch your career in technology. As a Yardi Romania intern you will have the opportunity to work on real projects that make life easier for millions of people, helping them find their dream homes, sell or administer their properties, manage tenant relationships, and make savvy investments. Your input will count as you will be involved in the design and development of functional and performance enhancements for our existing, large-scale, real estate products. We have 20 full-time internship openings. Gain experience and knowledge that counts, find mentorship and a great team, earn good pay, and work on projects that matter. You will also have the chance to be considered for full-time employment. Last year, 10 out of 13 interns got hired. Which technological area would you like to master? Visit our website and fill out the internship application form. Selection process: April 18 – May 31, 2017. The selection process involves a test and an interview with our experts. At Yardi Romania, we build products that make life easier for millions of people, helping them find their dream homes, sell or administer their properties, manage tenant relationships, and make savvy investments. We are part of Yardi Systems, Inc., an American company founded in 1984 that has grown to become the leading provider of software solutions for the real estate industry, employing over 5,000 people worldwide. Our development center in Cluj is the third largest Yardi office in the world, counting over 800 employees. Previous Post Next Post Care studenți sunt cei mai buni la programare din lume?